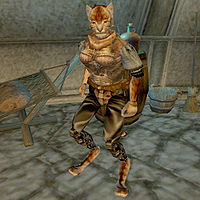 Shotherra is a Khajiit assassin found in Thongar's Tradehouse in Khuul. If she is killed, however, her relevance becomes clear: she wears the Amulet of Sanguine Glib Speech, a Sanguine item wanted by Morag Tong Grandmaster Eno Hlaalu. There is no actual clue to the fact that she has it. There is no way to acquire the amulet peacefully, as you cannot talk to her about it, and it cannot be pickpocketed because she is wearing it. You will have to kill her. But since she is a peaceful NPC, you will have to Taunt her into a fight or cast a Frenzy spell on her to make her attack first, unless you want to incur a bounty for murder. This page was last modified on 7 May 2013, at 18:31.